I have decided to take a break from taking advance orders for custom dulcimers. Five years ago about half my dulcimers were sold before I made them. Someone would choose from various options I offer and give me a deposit to begin making their dulcimer. I prioritized these custom orders and built them in the order they were received. While building these custom dulcimers I also had time to build dulcimers that were not already sold. I usually had three to five dulcimers on hand for sale. Five years ago I suddenly had to deal with some serious lower back issues that added unexpected flavor and color to my life. It has been an interesting journey and it is not yet over. I am currently able to work in the shop about one-third the amount of time I would prefer to be working. Some days or weeks I am able to work more, some less, some not at all, but it averages out to working about a third of the time I used to. During this time I have also had a surprising increase in custom orders. All but one dulcimer I have sold in the past 3 years was ordered in advance. My time in the shop has become completely focused on custom work. I keep thinking I will have time to build some dulcimers to put up for sale but it just hasn’t happened. 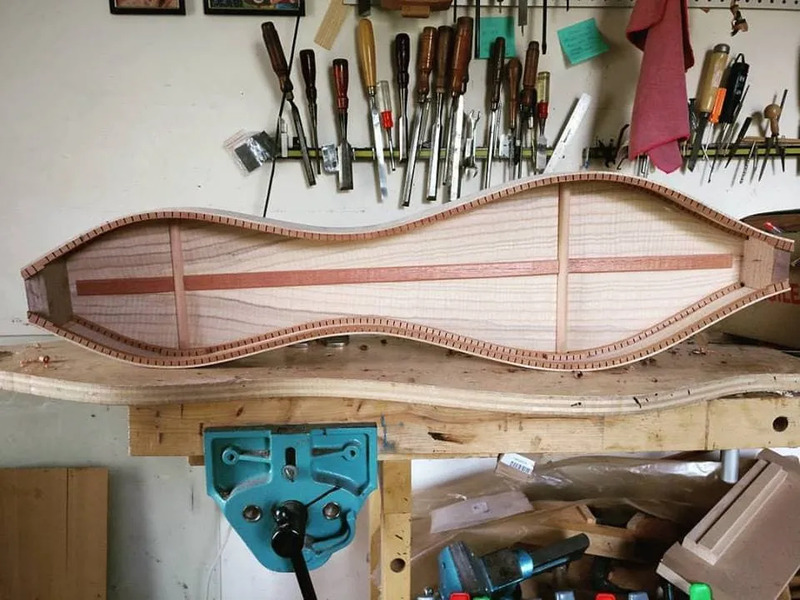 Most of the custom dulcimers I build are pretty much the same as dulcimers I would ordinarily build but the new owner chooses particular wood, string length, number of strings, fret patterns, and other options that I offer. Occasionally someone asked for a unique feature that had to do with playability for their particular style and when I felt it worked with my sense of instrument design then I would do that as well. The tricky part of this is that when I do have dulcimers on hand for sale they are sometimes not exactly what someone wants. If it has no dots in the fingerboard someone will want dots in the fingerboard. If it has 3 strings someone wants one just like it with 4 strings or vice-versa. In the near future I will be offering dulcimers for sale and I am thinking there will usually be something available that will appeal to someone. If someone wants something specific I will keep a list and contact them if I make something like what they want. I’ll also be happy to contact people and let them know when I have more dulcimers available. In the long run I think this will work better for everyone. When I put a dulcimer up for sale people can try it and know exactly what they are getting. I can ship it and you can return it if you decide you don’t care for it. I have sold many dulcimers this way and so far no one has decided not to keep it. With a custom order the dulcimer is yours. Unless there is a problem with it covered by my warranty the dulcimer is not returnable. Again, I have sold many dulcimers this way and almost everyone was 100% happy. One person was less than 100% happy but still liked the dulcimer. I think this is a good track record. So in the near future I will be only selling dulcimers that exist. If you are on my waiting list please don’t freak out! I am happily working on your dulcimer and you will get it on schedule. I agree take care of yourself. I to would like to own one your dulcimer someday. I would be happy with that you might make I have heard you play your dulcimer and I was pleased. I currently play a TK O’Brien dulcimer and started on one that I built from a kit by Chet Hines. Thanks for the kind words. When I first started making dulcimers I came across Chet’s book in a used bookstore. A few years later I became good friends with Ron Ewing. Ron started out as a dulcimer maker by working for Chet! Everyone starts playing not knowing how to play! Thanks for the kind words!